Rapper M.I.A. is currently looking for support to help build a school in Liberia. The 31-year-old British-born Paper Planes hit maker visited Liberia with 4REAL, a humanitarian-based TV show that features stars such as Cameron Diaz, Joaquin Phoenix, Eva Mendes, Casey Affleck, and Flea of the Red Hot Chili Peppers as they undertake adventures around the world to connect with young leaders who, under extreme circumstances, are affecting real change on some of the most pressing issues of our time. 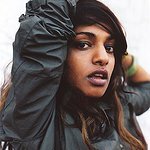 M.I.A., who is currently pregnant with her first baby, used $100,000 she was paid for a show earlier this year to kickstart her Liberian school project. “It costs $52k to build a school for 1,000 in Liberia,” she said. The school is now starting to take shape, and M.I.A. is asking for help with books and ideas for the school. More info about 4REAL and the 4REAL Foundation can be found at their website.